Chestnut Knoll provides compassionate, individualized care for seniors through their Personal Care Community, Memory Care Neighborhood, and At Home Services. Butterflies are Chestnut Knoll’s chosen logo and symbolize the beauty and grace that is shown by individuals as they experience transitions in their lives. Fine artist Joe Hoover painted “Knolla” to honor the facility’s work in the community. About 300 staff members, residents and their families picnicked in the morning. The day concluded with a free outdoor concert by the Boyertown Alumni Band. "One of the goals, since many of our residents are from the area, is to keep the residents very integrated into the community," said Shawn Berndt, Chestnut Knoll’s executive director. 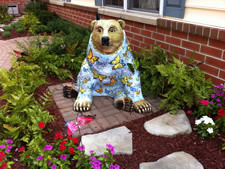 "We are honored to be a part of the Boyertown Community and Boyertown is known as ‘Bear Country’ for our local mascot,” said Barndt. "We join the other pieces of the community that put together a small town that has built in all the pieces needed for its citizens to thrive. Local people caring for local people." In the past 13 years, Chestnut Knoll has raised more than $106,000 for the Alzheimer’s Association, which gave attendees another cause for celebration at the party. Contributing to this article: Kristy Muenz, Media Relations, The Drawing Board, kristy@drawingboardgraphics.com, 610-373, 2446, ext 4. Joe is a retired teacher whose home is a flower garden inside and out, off the beaten path in a secluded spot in the Bucktown countryside accessible only along a dirt road. His home sits high on a hill—almost hidden by the trees. Outside, he’s managed to create a garden of annuals, perennials, and rose bushes providing a glorious display of color throughout the growing season and welcoming butterflies of all colors. Inside, his home features walls covered by his paintings, many of which feature the flowers he loves. Plus, there are remnants of art shows that he and his family mount each Fourth of July in which his young grandchildren performed assorted dance numbers and /or musical selections—depending on their passions of the moment. These art shows for the family include workshops, games, and demonstrations--opportunities for the children to try new artistic media. We noticed a unique wall divider between Joe’s kitchen and music room made of paper doll-like streamers featuring children and violins-- a leftover perhaps from a recent family holiday. Music, art, a love of nature and family enfold this family and enrich their lives. 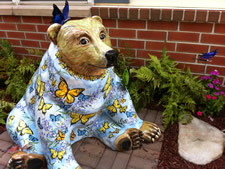 In addition to "Knolla," Joe created “Flora” for Jody and Loren Hulber; and, like Joe’s first Bear Fever bear, "Paul-bear," sponsored by Ott Funeral Home, “Knolla” is also full of the beauty, harmony, creativity, and peace that envelope the home and world of artist Joe Hoover. Joe credits James McFarland of the Wyomissing Institute for teaching him how to create a transparent effect in his watercolor technique. Joe enjoyed his well-planned, focused lessons and his honest critiques.